TIDAS is a 100% objective system that measures the degree of dispersion of pigment in a sample, using Hegman grind gauge. Fineness of grind is determined electronically thus removing the subjectivity of a human operator rating. The system ensures repeatability and consistency. The results are retained for quality assurance and product improvement processes. Measuring the degree of pigment dispersion during paint and pigment manufacture is a standard quality control test. Dispersion has traditionally been assessed on the commonly used Hegman grind gauge by experienced operators. The assessment is subjective and the results between operators may vary. In quality control situations such differences can lead to unnecessary rejection of product and possibly worse, acceptance of material that is actually out of specification. TIDAS eliminates operator subjectivity. It objectively measures the degree of dispersion of pigment in a sample. Images are retained for quality assurance or product improvement purposes. The instrument has been in production and use since 1997. The system is based on the Hegman grind gauge but removes the subjectivity of a human operator rating. The gauge, with freshly applied sample, is viewed by a high-resolution camera. The imaging algorithm displays a histogram of particle distribution. The histogram is then interrogated using algorithms to generate the sample rating. The process takes no longer than 10 sec. This automated system will ensure that pigment produced across the group’s factories is rated consistently. Analysis is no longer subjective. Every machine gives the same results for the same samples. The results are stored for quality assurance or product improvement purposes. The system can differentiate between particles and air bubbles. 0-25,0-50 and 100um gauges are a standard, other ranges available on request. 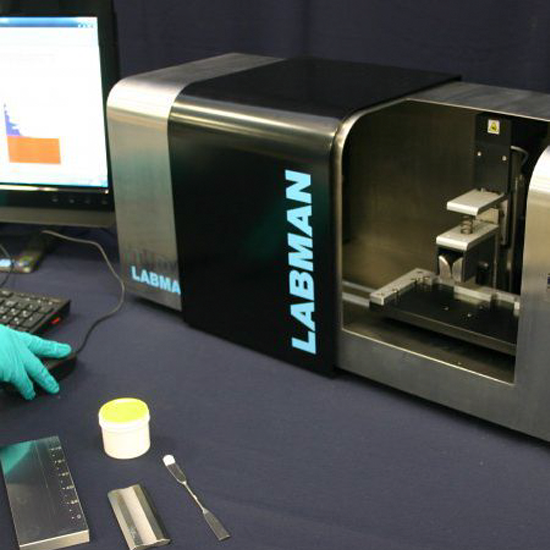 Labman can provide custom algorithms. It is designed in order to further reduce potential operator to operator variation. The keey advantage of the automatic drawdown option is that the time between application and measurement is consistent, minimizing potential variation with volatile samples. It uses disposable syringes and a standard blade scraper. USB interface, Windows compatible, controlled.